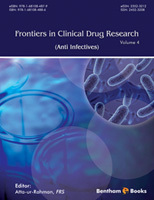 The fourth volume of Frontiers in Clinical Drug Research – Anti Infectives comprises six chapters that cover a variety of topics including, prolonging antibiotic life, biofilms in medical devices and various antiviral drugs. In the first chapter, Tolmasky reviews pharmacological strategies that can be used to improve the efficacy of antibiotics in the body. These strategies are important in the wake of an ongoing crisis of multi-drug resistant organisms. In the second chapter, Uda et al. review the information about catalytic antibodies that can act as antiviral medicines against specific virus targets including the rabies and influenza viruses. In chapter 3, Castilla et al. review the recent advances in drugs that target arenaviruses, pathogens that are responsible for haemorrhagic fever which is endemic to South America. In the fourth chapter, Ramírez and colleagues discuss the new role of steroids as therapeutic agents in viral infections. In chapter 5, Freire et al., provide an overview on the production and utilization of monoclonal antibodies as therapeutic agents, including their use for treating infectious diseases. In the last chapter, Azevedo et al. discuss different proposals for combating microfilms that form in medical indwelling devices (MIDs) in the body. Advances on this front can help medical professionals and engineers in keeping such devices longer in the body. Limiting infections caused by such biofilms also has clear benefits to patients. I hope that the readers will be pleased with the excellent and comprehensive reviews presented in this book in areas of contemporary importance. Finally, I would like to thank all the editorial staff of Bentham Science Publishers, particularly Dr. Faryal Sami, Mr. Shehzad Naqvi and Mr. Mahmood Alam for their technical support.